This wonderful historical novel is such a delight, such a treat to read, that I cannot recommend it highly enough. First suggested to me by a dear friend last year, I only recently grabbed the talking book edition with gusto. What an absolute delight to hear it spoken by someone who made each character come alive with such authenticity! 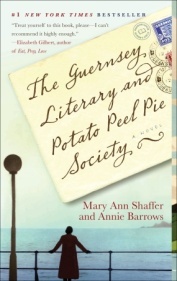 In 1946, in grim post-war London, author Juliet Ashton receives a letter from a member of The Guernsey Literary and Potato Peel Pie Society, a Mr Dawsey Adams and begins an extraordinary correspondence, which reveals the events of the German Occupation of Guernsey. The series of letters which follow as Juliet learns more and more about this extraordinary ‘book club’ and the lives of the Guernsey Islanders under the German rule draws both the reader and Juliet further and further into the Island’s experience. After the runaway success of her most recent book, Juliet has been casting about without inspiration for a new subject and begins to feel that a book could be made from these collective experiences of the Guernsey people. A visit to the Island to meet her new friends (all founding members of the Literary Society) including Dawsey, Amelia Maugery, Isola Pribby, Will Thisbee, Eban Ramsey as well as, most importantly, Kit McKenna turns into an extended stay in which Juliet becomes an accepted member of the Island’s unique society. Four year old Kit, ferret-loving, adorable and strong-minded, is the daughter of Elizabeth, the intelligent and resourceful woman who instigated the founding of the Society through her quick-wittedness in the face of German authority. Juliet soon comes to realise that her story of the Island’s occupation hinges on the exceptional woman whose presence – and absence- touched everyone’s lives. With characters that strike as both charming and quirky and a plot continually full of surprises, this is a book not to miss. Humour, pathos, romance and a fascinating insight into a little-known aspect of World War II combine to provide the reader with a glorious and memorable read. You may like to visit the book’s webpage here and read an excerpt. 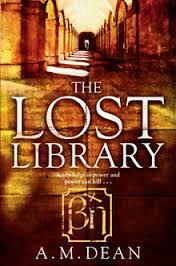 Reminiscent of The Da Vinci Code, The Lost Library is a global conspiracy thriller which sends Professor Emily Wess on a search for the Lost Library of Alexandria. Following the murder of her colleague Arno Holmstrand, Emily is delivered of cryptic messages and hurtles into a dangerous and dark puzzle-solving mission. Holmstrand was the last Keeper of the Library, which was not and never has been ‘lost’. Emily is revealed as the new Keeper and against all odds, defeats the Library’s age old nemesis, the Council – a group that desires all the power and political advantage the Library’s resources can give them. While I found the constant ‘clock ticking’ signification of the time elapsing at a very fast pace, as Emily embarks on her international search, irritating – the book does move along with an urgency that adds to the tension. You can find more about it here including a trailer and an excerpt. By coincidence, I had just watched the BBC mini-series of The Virgin Queen and realised how scanty my knowledge of Mary, Queen of Scots was, when I picked this one up from the library. After escaping from Scotland ousted by her noblemen, Mary Queen of Scots lands in England, where her cousin, Elizabeth I, is on the throne, lured by the promise of sanctuary and help. Knowing she is under threat, particularly with her own kingdom in a state of flux, Elizabeth ‘detains’ her royal cousin and places her in the household of one of her most trusted nobles, Earl of Shrewsbury, George Talbot and his new wife, Bess. The recently married couple’s home becomes an ongoing prison for the young Scottish Queen and the centre of political intrigue and rebellion against Elizabeth. The cost of keeping a royal court for the hapless Mary, as well as her seductive personality becomes a growing threat for the Talbots. Weeks turn into years as Elizabeth continually dangles the prospect of restoring Mary to her throne, and the Queen of Scots responds by intensifying her secret plotting, without regard to the danger to others, including her ‘hosts’. As with all Phillipa Gregory’s novels, impeccably researched and beautifully written, this does not disappoint. Stay posted for an upcoming blog interview with Geoffrey McSkimming himself! Quite a few years ago now, when I was teacher-librarian at a lovely Sunshine Coast hinterland school, and trying to engage more boys in reading for pleasure (an ongoing mission! ), I was fortunate enough to host Geoffrey McSkimming aka Cairo Jim for an afternoon of fun and madcap inspiration. What a successful venture it was – boys were hounding me for months afterwards gobbling up the Cairo Jim series and more. Now it is a real pleasure to review Geoffrey’s newest series with more unforgettable characters, fast-paced plots and a superlative dash of magic. Meet Phyllis Wong, great- granddaughter of the famous Wallace Wong (that great 1930s conjuror of stage and screen fame) herself a cannily adept magician. Phyllis lives in the beautiful Art Deco apartment block built by her fantastical forebear along with her Dad, Harvey, and a very smart fox terrier called Daisy. Her best friend Clement is an able foil and sometimes inept assistant for her adventures and the cast is rounded out by other inhabitants of the Wallace Wong Building, all of them rather unmistakeable and somewhat eccentric. This first adventure begins with the distressed Mrs Lowerblast, proprietor of Lowerblast’s Antiques & Collectables Emporium (ground level Wallace Wong Building) being terribly upset to discover the theft of a precious piece of Australiana pottery. As things heat up a valuable diamond necklace also disappears, closely followed by a rare Picasso, without so much as the slightest hint of a human culprit being involved. Could it possibly be…well, ghosts? How can a valuable necklace – securely protected – just vanish into thin air as if by magic? Ahh, as if by magic! 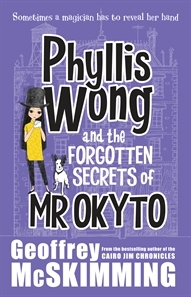 – Phyllis Wong brings all her unusual powers of observation and thinking into play and combined with her expert knowledge of sleight-of-hand manages to reveal a very nasty criminal, helping out her friend and neighbour Chief Inspector Inglis. Geoffrey’s skill with bringing characters to life on the page, his quirkiness with language and his ability to create a rollicking mystery laced with humour and cleverness never fails to impress. Phyllis Wong lives in a very modern world, with all the gadgetry young readers are used to yet the story still retains the essential flavour of older style adventure-mysteries with their endless appeal, where Good always triumphs over Evil. The city in which she lives is skilfully anonymous enabling any reader to project themselves into the thick of the action with ease. Phyllis is a strong character being smart, resourceful and mature, with a fierce loyalty to her friends of all ages. With plenty to engage both boy and girl readers this will be a sure-fire hit with children aged around Upper Primary to Lower Secondary. The second of the Phyllis Wong Mysteries sees Phyllis, Clement and Chief Inspector Inglis caught up in a baffling case of rare Shakespearean published folios, which are suddenly appearing in auctions. How can it be that such rare items as the First Folios of Shakespeare can almost flood the market, when so few of them have survived the centuries since they were first published? Of course, if one could travel back in time and buy them firsthand and bring them back to the present day that would make perfect sense. But that is impossible – or is it? 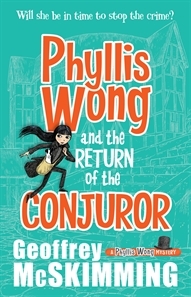 Phyllis is astounded to meet her famous great-grandfather Wallace Wong when he travels through time and re-appears in his old basement of magical wonders, now Phyllis’ own workshop. Wallace shares with Phyllis the secret of ‘Transiting’ through strange Pockets in time and space, a skill he developed through his dedicated study of science, inspired by Einstein’s theories, as well as his own application of the mysteries of magic. This certainly explains Wallace’s strange disappearance in the middle of his act in Venezuela, back in 1936. And – importantly, explains how the nasty Mistress Colley is obtaining Shakespearean First Folios to sell for enormous profits. Not exactly illegal, if somewhat unethical but when it becomes apparent that Mistress Colley intends to steal original manuscripts written by the Bard, it’s time for the resourceful Miss Wong to step in. Phyllis, Clement and Chief Inspector Inglis know the only way to foil the plans of the loathsome Mistress Colley is to Transit back to The Globe and thwart her illicit designs. As one might imagine, there is bemusement – and amusement – all round for obvious reasons when strangers appear and try to warn William Shakespeare. However, as with all satisfying adventure-mysteries, the action rolls on and the villain is stymied. Another real page-turner (I read it in one sitting!) this second volume of Phyllis Wong certainly has me anticipating the next instalment. Be sure not to miss out, put these on your shopping list – they are guaranteed to ‘vanish’ off the shelves rapidly! Yesterday I was delighted to hear Belinda speak to a very interested gathering at Black Cat Books & Cafe, in Paddington (Qld) and equally chuffed to meet her, after a very kind introduction by Zoe Bechara, publicist for Random House. Zoe and I have often corresponded over the reviews I have done for RH and it was a joy to put a face to a name at last. Belinda thoroughly engaged her audience talking about her various books – my favourites being the ‘time slip’ series of which The Sequin Star is the latest. Younger listeners were thrilled to hear more about Lulu Bell’s latest adventures with a sneak peek of the upcoming Christmas title’s proposed cover. One shy small person who had come dressed in her pyjamas with very apt bunny slippers a la Lulu Bell and the Pyjama Party, the newest title in the series, was awarded a very special prize! Therefore, I was rather pleased that due to the busy-ness of this past term that I had not yet written a review of The Sequin Star – and also had just received the two newest Lulu Bell titles and can post the reviews to follow up such a lovely afternoon. Do take time to look at Belinda’s website – with trailers and background information. Also – read samplers here at Random House Books. When I reviewed The River Charm, I recall making the comment that Belinda’s other books in this series were NEVER in the library long enough for me to read any but their popularity with the girls had certainly given me the indication of their worth. Claire’s return to the past puts her into the often precarious life of a travelling circus – hard work, prejudices, run aways, beautiful costumes, ‘family’ of unrelated people and some true friends – which include her grandparents as their younger selves. Giving her an insight and previously unknown information about her family history Claire discovers much more than just her own heritage, learning much about the injustices and inequities of this period in Australia’s history, as well as the staunchness of some who gave of themselves to right wrongs. As with Belinda’s others of this series, the reading is accessible and vibrant, not to mention thoroughly absorbing for those interested in novels with more substance than vampire teenagers and love sick angst. These are highly recommended for girls from Upper Primary to Lower Secondary, and even reluctant readers would enjoy the pace of the stories. These two new titles in Belinda’s Lulu Bell series are my first experience and I just know they are going to be a huge hit with Little Miss 9 who would love to be Lulu Bell and growing up in a vet hospital! A Year 3 excursion to the zoo is a very exciting event for Lulu Bell and her friends – albeit she is so used to animals! After all, the zoo vet is a great friend of Lulu’s dad and she, Molly and other friends will be getting special attention (much like Miss 9’s experience in March as a ‘birthday girl’ at her beloved Australia Zoo!). When the poor tiger cub runs into problems and needs to have treatment at the zoo’s hospital, Lulu and Molly are right there to watch Berani’s operation. All little girls love sleepovers (raising three, now grown up, daughters gives me personal insight into this!). Lulu Bell and her friends are very excited about their own pyjama party, planning all the usual games, fun, treats and stories. However, when you live in a vet hospital, you never quite know what other excitements might arise – such as an orphaned wallaby arriving or a new litter of puppies needing help. Pyjamas or not, Lulu, Sam and Molly are only too ready to help Dad out with his cases and in the process, as with the other Lulu books, offer readers some inside knowledge and facts presented in a very palatable and engaging manner. These books are adorable – really adorable. The characters are (yes, I know this sounds lame) wholesome and fun. The adventures are perfect for the age group and I can easily see newly independent reading girls eating them up. Belinda is definitely on another winner here! Highly recommended for little girls aged 6 to probably about 9/10. What a joy to take five nervous Year 6 boys to Readers Cup for the first time – and though they didn’t do as well as they might have hoped, they are completely fired up to rocket into next year’s comp. Lovely to meet Tristan Bancks for the first time – thank you for the charming inscription in my review copy of ‘Two Wolves’ and the complimentary response to my review! If you watch At the Movies with David and Margaret, you will know that David panned this claiming to be an ‘old grouch’ (David, the trip to Amsterdam is NOT a side issue – you missed the point completely!) and Margaret liked it enough to give it 3.5 stars. Well I am giving it a resounding 4.5 stars. After the huge success of the YA novel, I was possibly one of the last teacher-librarians I know to actually read the book but found it moving with the kind of dark humour favoured by my family, then continued to promote it heavily to every student and colleague I know. The movie was no disappointment. 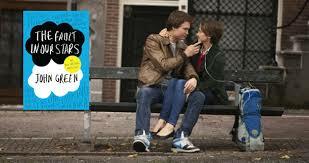 Naturally, quite a bit of back story was left out but this in no way detracted from the real focus of the movie as Hazel and Augustus deal with the painful realities of their individual and shared circumstances. I thought the casting was superb with each of the significant characters played convincingly (Shailene Woodley, Ansel Elgort, Nat Wolff, Laura Dern, Willem Dafoe) and true to the novel without compromise. All those who adored the book – and in my sphere that includes males and females – I don’t think for a moment you will be disappointed. Certainly, my friend and I, plus everyone else in the cinema clearly were not! While we were not ‘literally in the heart of Jesus’ , for a couple of hours, we were all in a very special place. 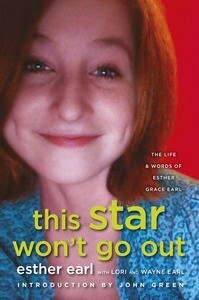 Don’t forget to check out my previous post on “This Star Won’t Go Out” Esther Earl, on which John Green drew his inspiration for his novel. The mother-and-daughter team of three continue their mission to encourage imaginative play combined with storytelling for young children with this new Beetle Bottoms adventure. The Beetle Bottoms are tiny wee creatures living in your very own background. In this new adventure, Pip and Petal discover that Beetle Bottoms are not all pink-skinned like their own tribe, discovering brown-skinned HoneyKeeper Beetle Bottoms children, after a bee hive relocates to their tree. Together with their new friends, they join up with their Apple Keeper Beetle Bottoms friends and while they all are a little surprised to discover differences between themselves; they instantly all like each other. Some delicious feasting on honey and apple juice and some fun playtime together exhausts the whole group and they fall asleep curled up in one cuddly pile. When the assorted Beetle Bottom parents wake up and discover empty beds, there is consternation all around. The elders from the tribes are all deeply suspicious of each other when they collide in their search for their respective children but put aside long years of differences to find the missing little people together. With great relief at discovering the missing adventurers, the tribes come together in a celebratory feast. A gorgeous exploration of the truth that children judge each other on their connection with each other and not appearances, as well as a timely reminder to parents on the subject of ‘inherited’ prejudices. Click on the book cover to watch the book trailer. Sign up on the Beetle Bottom website for their newsletter and receive a free play book for your own child. Marc Martin has utilised his very attractive graphic artist approach to this lastest picture book, which is an endearing story of friendship. Martin draws his inspiration from the world around him – both natural and human environment. 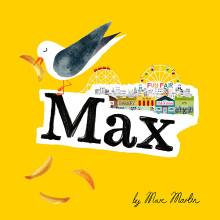 Max is a seagull and Bob owns a fish and chip shop. Together they are have a charming friendship based on simple pleasures – namely, hot chips and fishing – and their enjoyment in each other’s company. When Bob’s shop fails to continue profitably he must relocate his premises from their sleepy beachside town to the city. Max waits patiently for his return, but when it seems this is not forthcoming, sets off to find his best mate. Two particularly glorious double page spreads provide a rich visual to the extent of Max’ journey and he is well rewarded when his finely attuned olfactory sense recognises the smell of delicious hot chips, leading him to Bob’s new shop. The two friends are delighted at being reunited and resume their shared pleasures of fishing and eating chips. This is a simple story, simply told, but with an undeniable resonance for younger readers. The wonderful illustrations, use of white space and simple text combine perfectly to result in a very attractive picture book for readers from 5 years up – and a perfect vehicle for exploring friendships, our neighbourhoods and the contrasts of settings. I can practically guarantee that every teacher has had, at some point, a Nadine in their class. Nadine is a very talented, very brave and very special cow – well, in her own opinion which is, after all, the only one that really counts. With some rollicking rhyming Nadine impresses her friends with her daring tour through the scary woods. Friends being suitably awed, they depart – night falls and Nadine is left on her own in a spooky gloomy cave. Suddenly her bravado evaporates and she must conquer her sudden lapse of over-confidence. 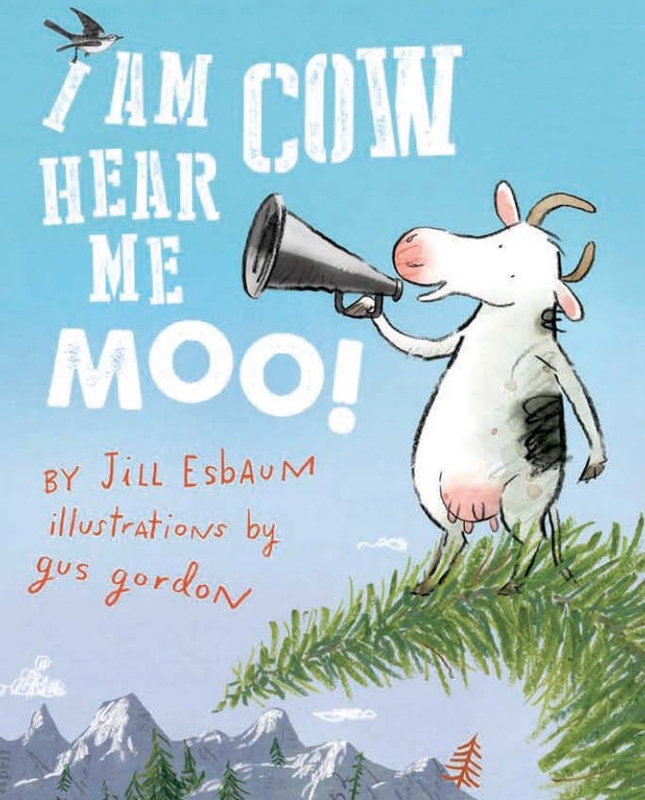 As always, Gus Gordon’s illustrations are absolutely delightful and make this picture book a must have. Young children will enjoy the story and rhythm and no doubt will recognise the Nadine in their midst. 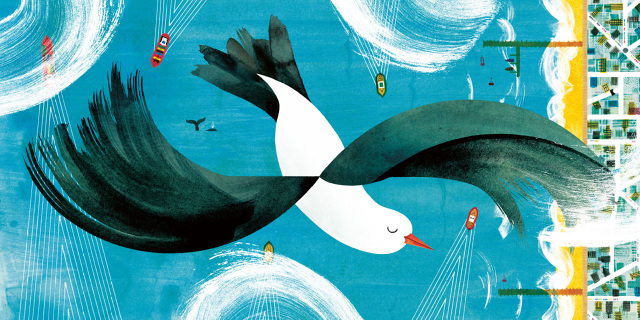 This parable would be a very useful discussion starter for smaller people – what is bravery? is it important how others perceive us? is it important how we see ourselves? Having confidence is a wonderful thing and there would be some small people who would truly benefit from recognising that they have that confidence in themselves. Welcome to HarperCollins Teachers’ Hub. Find our latest books, teachers’ support materials, reviews, catalogues, curriculum related text, events and more! Rabbit Ears Productions Fans UNITE! Musings, Recipes, Gardenings, Books and assorted stuff I like. When Innovation slaps you in the face, we slap back. composting information . . . it could take some time! Book review blog from Australia featuring young adult reviews and discussions.